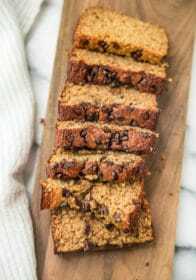 Learn my tricks for an easy Low Fat Flourless Banana Bread that bakes up irresistibly delicious and moist. 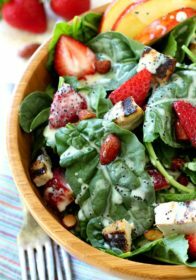 You can even whip it up super quick in the blender! It is just the best feeling waking up to notice banana bread sitting on the counter waiting to be devoured. You know it’s going to be even better than it was the first day, if that’s even possible. Banana bread is seriously my favorite, but I can get a little carried away with eating a few too many slices. Anyone else? After craving a thick warm slice of banana bread for weeks, I just knew a guilt-free banana bread version had to happen. 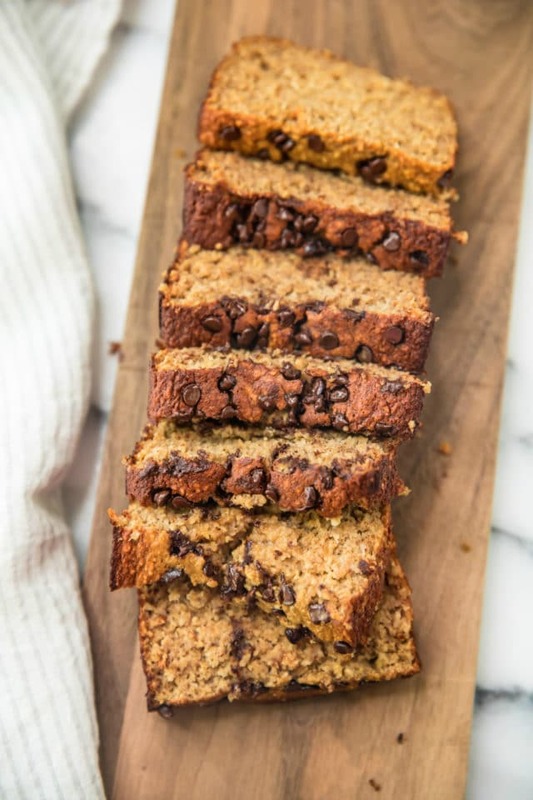 This banana bread comes to you with a few secrets that make it lightened up, but keeps it tasty and gives it a wonderful moist texture. I also wanted it to be super simple and I know how much you guys love mixing recipes up in the blender…. 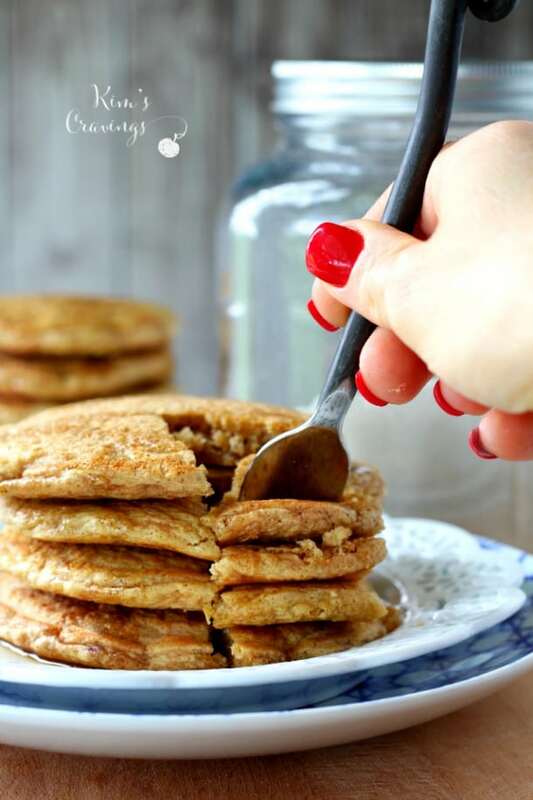 my banana oat pancakes happen to be one of the most popular recipes at Kim’s Cravings, so I made sure all of the ingredients could be thrown into the blender, mixed and then conveniently poured into a loaf pan. I used old fashioned rolled oats instead of flour. Using oats for baking whole grain treats is a favorite of mine. The oats add substance, giving this bread its deliciously hearty texture. And without any flour weighing down the recipe, the sweetness of the bananas really shines through. Not exactly surprising, but the bananas truly are the key to making good banana bread. You must use very ripe bananas! The ones with more brown spots than yellow are ideal. Brown bananas have a stronger flavor and more natural sweetness than the really yellow ones. If you use yellow bananas or yellow bananas with a few brown spots, your banana bread may taste bland. It’s totally worth waiting for your bananas to turn extremely brown and speckled! As long as you use those really ripe bananas, you’ll only need to add a touch of sweetener. I used only 1/4 cup xylitol sweetener (like this XyloSweet!) to boost the natural sweetness. You can experiment with sweeteners of choice. Maple syrup or honey would also be great choices. I would still use about 1/4 cup, or 1/2 cup if you want your bread really sweet. The bananas not only provide flavor and sweetness, they also help with the tender texture. Yet another reason why ripe bananas are best. The pure yellow ones are much starchier, so they won’t produce the same tender texture. Because we’re not using any butter or oil, it’s really important to use those supremely ripe bananas! The applesauce helps with this tender texture and also makes the banana bread perfectly moist. My favorite secret ingredient in this bread is vinegar! Just a small amount that you’ll never taste! 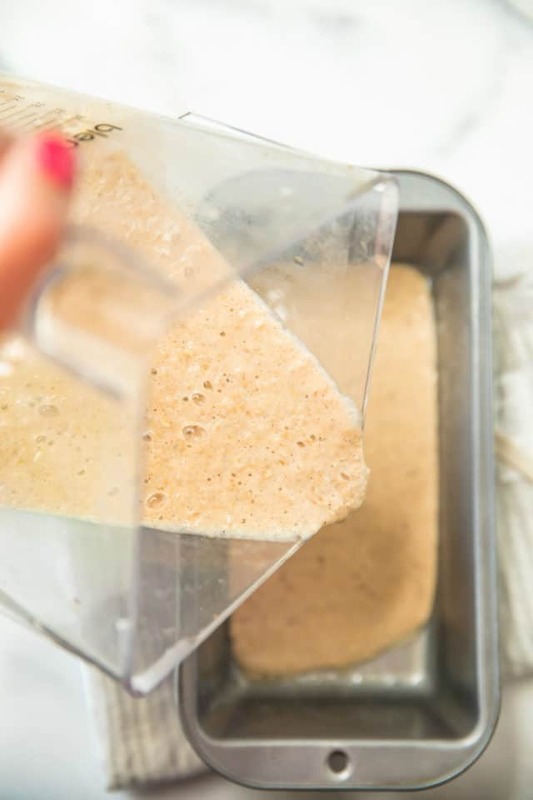 The vinegar works in this bread by reacting with the baking soda, which will help the banana bread rise better and also helps with the tender texture. To keep the bread from sinking in the middle, you’ll want to make sure you bake it long enough. Leaving it in the oven longer can result in an overly brown or burnt top. Covering the bread with foil acts as a shield, preventing that burned top, while still allowing the center to keep cooking through. Partway through baking, you’ll quickly remove the foil and immediately pop the pan back in the oven. (Act FAST! If you take too long, your loaf will start to sink!) Removing the foil allows the center to turn a nice golden brown during the last part of baking. Last important step. For the best texture, wait until the banana bread has fully cooled before slicing into it. The center is still “setting” while it cools, so cutting into it before the center is at room temperature isn’t a good idea. 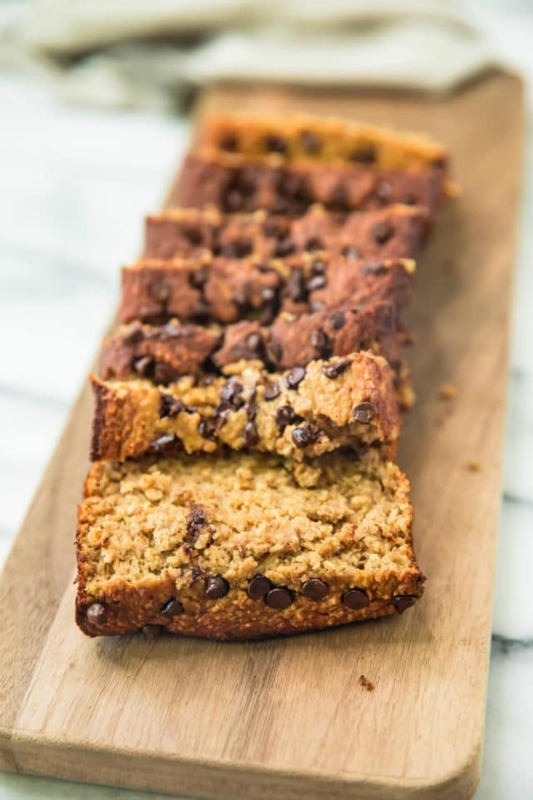 Once the sides of your banana bread feel like it’s at room temperature, you can pop the loaf in the fridge until the bottom feels chilled to speed up the cooling process. Hope you guys love this bread as much as I do. If you make it be sure to snap a picture and tag it on Instagram using #kimscravings and @kimscravings IN the photo itself! 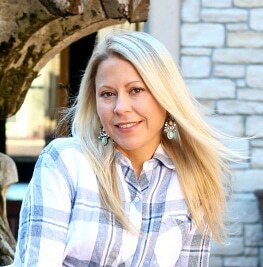 (That guarantees I’ll see your picture! 😊) Also, leave a comment below! 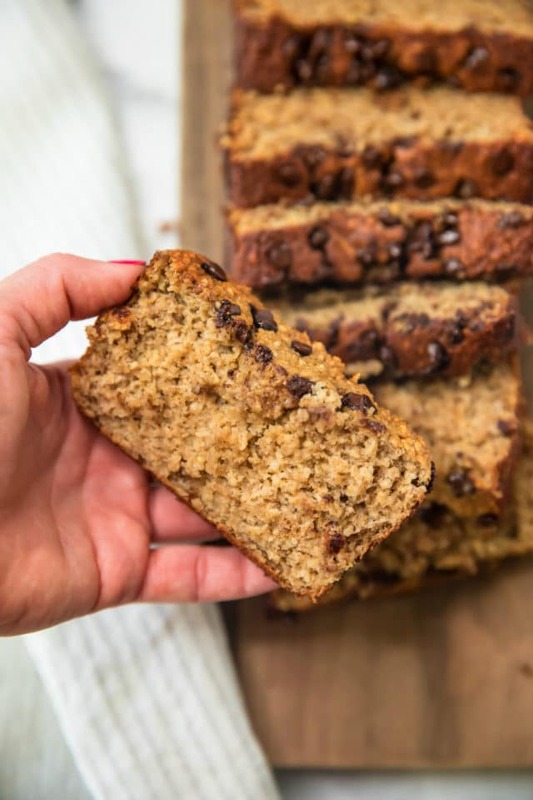 The best low fat banana bread, whipped up in your blender! 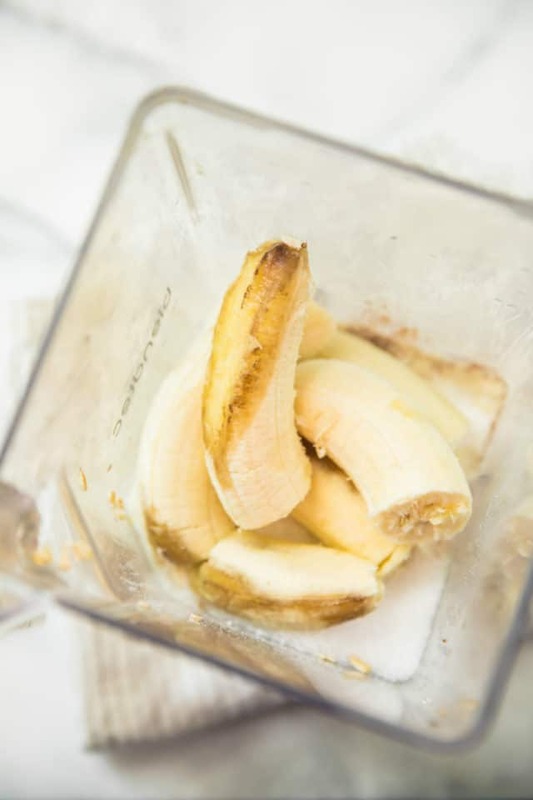 Mix all of the ingredients together in a blender, blend until mixture is smooth. Pour mixture into prepared bread pan and bake for 40-50 minutes, or until a toothpick comes out clean. Let cool and slice into 8 slices. Enjoy! Store any leftovers in fridge for up to one week, or in the freezer for up to one month. **Nutritional information is calculated using Ideal Lean Vanilla Protein Powder and 1 tablespoon Enjoy Life semi-sweet chips. ***A note on pan size: I used a 8 1/2- by 4 1/2-inch loaf pan; if you only have a 9- by 5-inch pan, start checking for doneness 5 to 10 minutes earlier. ****Store banana bread at room temperature up to 2 days, in the refrigerator up to 5 days, or in the freezer up to 3 months. *****For healthy banana muffins: Divide the batter between muffin cups then bake at 350 degrees F until a toothpick can be inserted and come out clean, 20 to 25 minutes. Hi!!! Two questions. You put the foiled paper at the beginning and then after the half time of banking you remove it ? How many bananas did you use? Thanks so much! I used 3 medium to large bananas. The first time I made this recipe, I didn’t put foil on at all. The bread got really dark on the outside, but it honestly still had great flavor (no burnt taste) and texture. The second time I made it, I put the foil over it at the beginning and when it had about 15 minutes left to bake, I removed it. Good luck! Let me know how you like it! Awesome! So glad you enjoyed!! Oh yum, this sounds tasty! I’ve always been a fan of banana bread. I would never have thought to add vinegar to a baked good recipe. I am so interested in giving this recipe a whirl…in my blender. Yum! 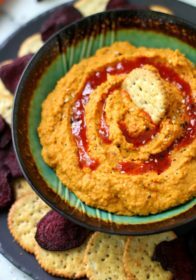 I love how you healhified this recipe! And adding oatmeal is genius. 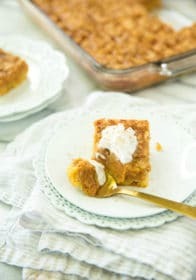 Makes me want to try that with my favorite pumpkin bread recipe! Banana bread is so good! 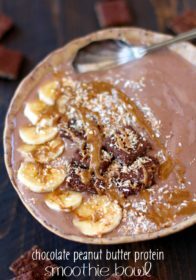 I love that this recipe is flour free and can have chocolate! I will be making this for my son and I this week! Thank you for sharing! I can just imagine the smell of this banana bread baking! I’m going to have to stash some bananas away to make this. Anxious to try your vinegar tip! I love using oats for flour! The texture is SO good. Can’t wait to try this!! This looks delicious! My friend would love this ‘Im going to pass it on and pin for later! Looking so Yummy! Healthy plus delicious. That’s what I always look for. Your banana bread is gorgeous! 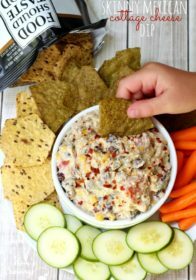 Love the idea of adding protein powder and apple sauce! I love banana bread, and this one sounds epic. Going to have to try this recipe out sometime soon. I love banana bread. It will be amazing to try out your recipe. 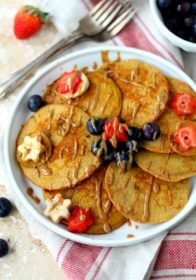 Can I substitute oat flour for the rolled oats? And would a combination of oat flour and almond flour work. I used rolled oats, but then blended everything. I’m not quite sure how this would work with blending them up. You may just need to add more oats, if you notice the batter is too liquidy. I definitely think a combo of almond flour and oats would work well. Would love to know how everything turns out! Good luck! This looks amazing! I have never used protein powder in baking. Just made these this morning into muffins. So so good! The texture is perfect! How many muffins are a serving? Thanks so much for your comment! I’m so glad that muffins worked well for this recipe. If your recipe made 8 muffins, 1 muffin should be the serving size. I just made this and it tastes great! But for some reason the middle part didn’t cook fully even though I baked it for 60 mins. I covered it with foil first 25 mins and then removed it. The sides were well done. Should I have left it to cook longer? I’m so sorry you had that problem. 60 mins seems like it should have been plenty, but maybe you should have cooked it a little longer. I didn’t have any trouble with mine cooking through… I wonder if it might have something to do with altitude. If you do try again, you might try your oven at 375 and if the bread starts getting darker on top, cover it with foil.